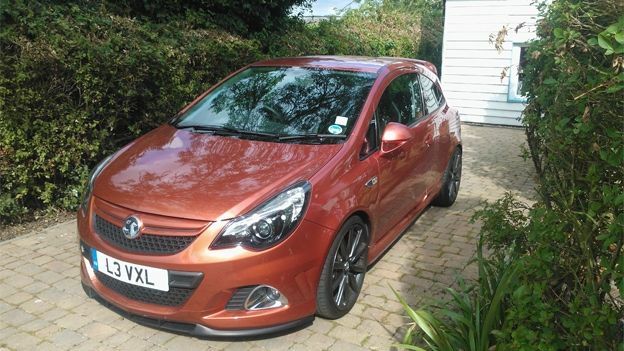 The Vauxhall Corsa VXR Nurburgring is Vauxhall's latest creation from its VXR skunkworks and as such it comes with all the pomp and circumstance that you've come to expect from modern-day hot hatches. Spoiler? Check. Huge rims? Check. However if you look beneath the surface you'll find that there is actually something much more primal waiting to jump out at you. A quick look at the stats gives you some inkling of what's in store: 0-60 in 6.5secs, 1.6i 16v Turbocharged engine and a top speed of 143mph. Add that to a car that has been lowered, comes with lowered Bilstein springs and inverted dampeners and an Electronic Stability Program that could corner a double decker on a dime and you begin to get some idea. With this being a hardened track-specialised car you'd have thought Vauxhall would be happy to shed all the optional extras. Think again. The VXR Nurburgring comes with a full on-board multi-media system that has been skinned to fit the racing interior. At the press of a button you can access the SatNav system which offers an impressive array of features not found on standard SatNavs including live and truly comprehensive traffic updates including a superb detour system which will instantly re-route you around any accident or traffic jam. Of course like any sat nav it's not without its faults, the system tried on three occasions to take us through the centre of London, a move which would have almost certainly resulted in teeth-gnashing delays. Once put straight however it tried the central route no further and instead took to offering us re-routes through the rush-hour traffic, saving a considerable amount of time. Elsewhere you'll find a Bluetooth voice-command system which integrates with your phone letting you call, send texts and even have the car read your texts to you. iPod connectivity is almost considered a standard these days and the VXR is no different giving you steering wheel controls while the audio system automatically adjusts the volume dependant on just how much you want to destroy those tires. Offering up Recaro front-seats Vauxhall has then taken it a step further adding front and side airbags to each whilst also throwing some heated seats for those soon to be looming winter nights. Finally Vauxhall has equipped the VXR Nurburgring with their cornering headlights system which automatically engages a sidelight upon using the indicators and then turns the main headlights along with the steering wheel in the direction you're turning. It's a brilliant system which becomes all the more relevant for the VXR with optimum visibility being a must when cornering at speed. While many modern cars today will employ the wealth of technology at our disposal to make themselves more efficient the VXR Nurburgring impolitely disagrees with this school of thought, instead devoting every last ounce of its being to making sure you stay glued to the road while your kidneys go flying out the window. The acceleration is hugely impressive, made all the more so thanks to the two tuned exhausts at the back but also because despite all the electronic wizardry at work it still feels as though it's just an engine, four wheels and some lunatic stupid enough to press the accelerator pedal. If that wasn't enough you then try and turn and the car buries its nose into the ground keeping the line to a degree that makes you wonder if there isn't some giant magnet under the tarmac. The most impressive feature by far however is its ability to pick up and go regardless of the gear you're in. Whether it's coming out of a corner in a country lane or simply hitting the motorway you press the accelerator and this low rumbling explosion hits you soon followed by the whistling cry of the turbocharger. It's addictive. Vauxhall should be commended on creating a car that manages to make you feel like you really could take it onto a track and it would more than hold its own, while then offering up an interior package that would make many entry-level family cars weep in terms of tech. With the optional extras this car weighs in at well over £24,000 which for a 3-door hatch is sheer lunacy. Of course if you're even considering buying this car then that sentence won't have made a blind bit of difference because you'll have booked in for a test-drive, taken it out and completely fallen in love with its boy racer styling, eye-watering colour scheme and kidney-punching performance.